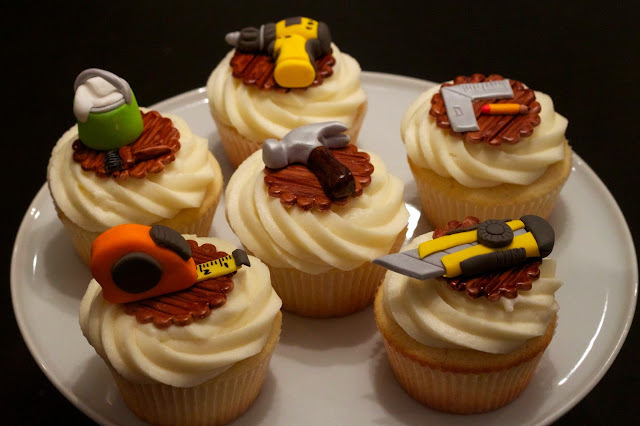 I have been wanting to make these cupcakes for a while as a thank you for our contractor (Cornerbrook Construction) but just didn't have the time. 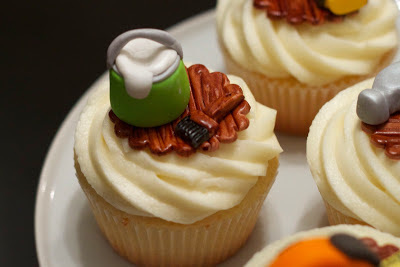 Once we got settled in the house, I had a few cake projects on the go, then Christmas and school work. 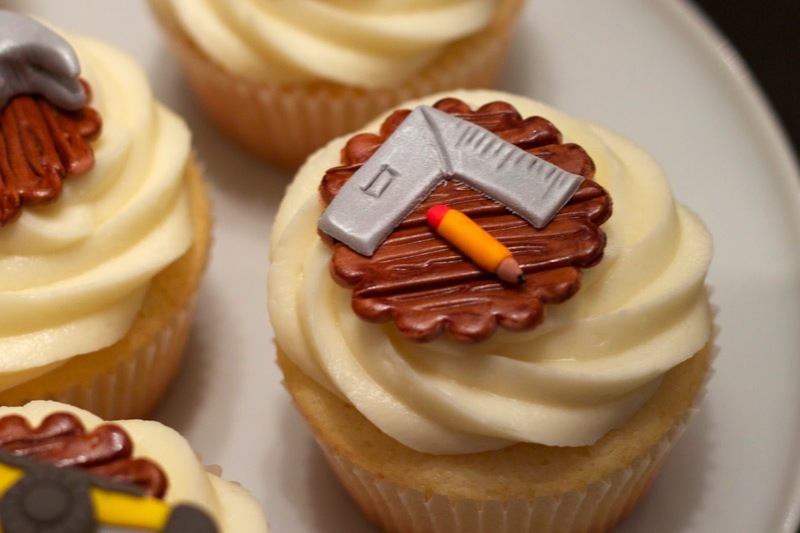 We were due for our final inspection by the city for our renovation, so I thought it would be the perfect time to make these construction-themed treats. It was fun selecting which tools I thought would make good cupcake toppers. The first one I made was a 'DEWALT'-like drill because I think I've seen that brand a lot in places that sell tools. I am in the market for a drill because we still haven't put up curtains on the main floor or any pictures, but I think I'll start off with something a little less fancy. 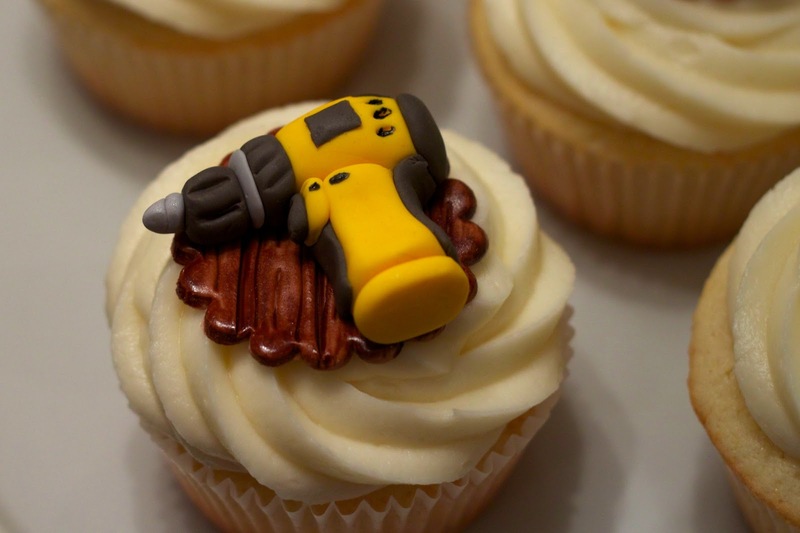 This one is my kind of drill - it's edible! The next tool was a hammer. I used a bit of shimmer to make it look a little metallic and used brown gel paste and vodka to make a wood-like handle. 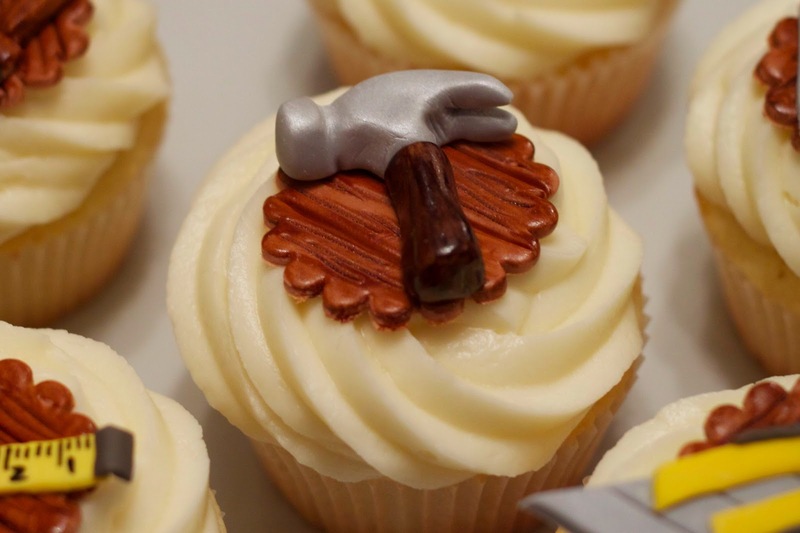 I'm not sure if I even noticed any hammers lying around during the renovation though. 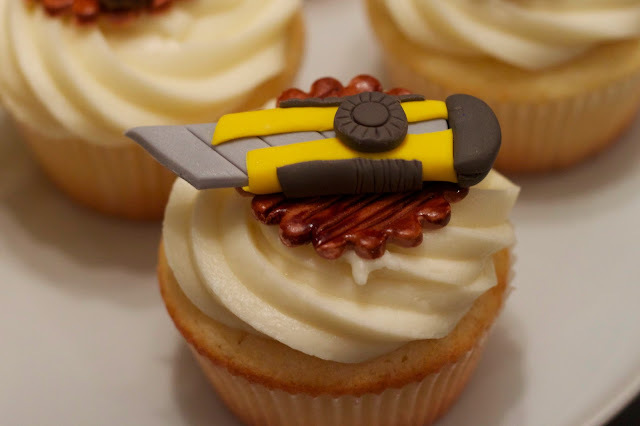 They had fancy things like nail-guns which I didn't think would make as cute of a cupcake decoration. The measuring tape is one of my favourite toppers and something that was very handy in planning our renovations and furniture placement. There was lots of painting to be done! To save a bit of money, we decided to paint the upper floor ourselves. I remember frantically doing the second coat in the Master bedroom just before the moving truck arrived with our furniture. There is still a small portion of unpainted walls in the upstairs hallway. I haven't quite recovered enough to tackle that yet. I don't think I ever saw a square hanging round but it seems like a very important tool. Maybe it wasn't used for our renovation. I have no idea. That's why we hired a contractor. 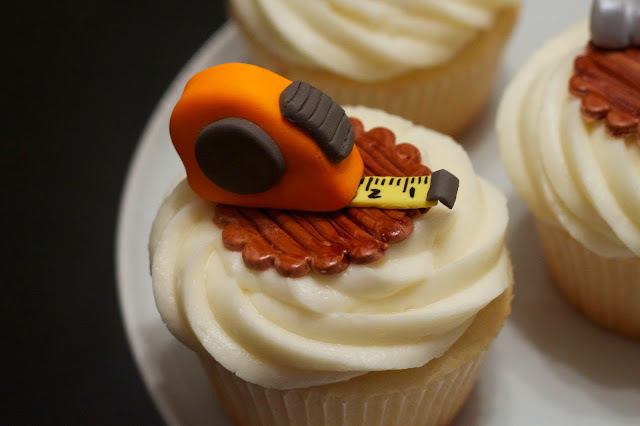 The X-Acto knife if my favourite of the cupcake toppers. This is an invaluable tool for renovating and moving because you are forever dealing with boxes and cardboard. In retrospect, I should have made a broom or a shopVac as the part I remember most about the renovation (aside from how much I love our house now) was dust, dust and more dust! 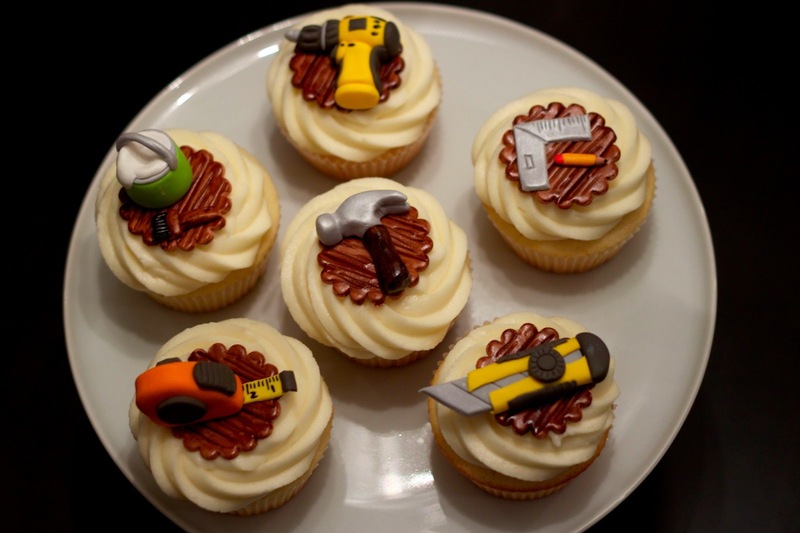 While very stressful taking on a the purchase of an old house, the renovation and moving all in a very tight timeline (I'm not even going to talk about selling our condo), it was a neat process - walking into an open house and thinking 'this house requires too much work! 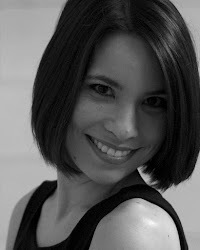 ', to buying that house, planning the renovation and seeing what you pictured for the house become a reality. Cornerbrook Construction was great, especially considering how OCD detail-oriented I am.